Aviation Updates Philippines - The Philippines' leading carrier, Cebu Pacific (PSE:CEB), received its 36th brand-new Airbus A320 aircraft today. The plane was delivered straight from the Airbus factory in Toulouse, France. Photo by Ajig Ibasco - Cebu Pacific Air. 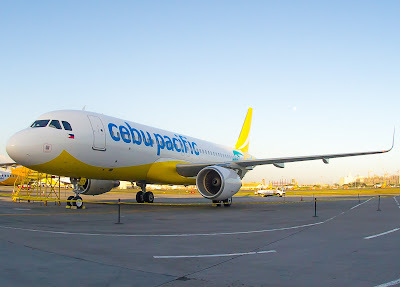 Equipped with fuel-saving wingtip devices called Sharklets, the Airbus A320 is coated with CEB's revamped livery which features shades of the country's land, sea, sky, and sun. This delivery brings CEB's current fleet to 57, comprising 7 Airbus A319, 36 Airbus A320, 6 Airbus A330, and 8 ATR 72-500 aircraft. CEB's fleet remains one of the youngest in the world, with an average age of 4.78 years. "We continue to optimize our growing fleet, enabling more passengers to reap the benefits of fast, seamless, and affordable air travel. We are looking forward to taking additional planes this year until 2021, to serve the ever-growing domestic and international markets," said Atty. JR Mantaring, CEB Vice President for Corporate Affairs.